Artie Yellowhorse along with her two daughters, Desiree and Lei Lani design some of the most outstanding contemporary jewelry pieces in today's market. 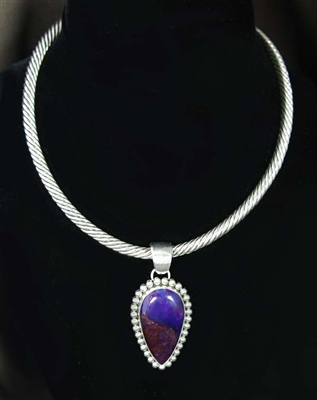 Beautiful crafted this lovely, sterling silver pendant features a multi colored Sugilite stone, framed with sterling silver drops. 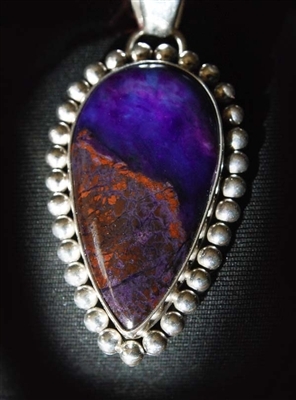 This is a great example of the quality workmanship in their jewelry. The pendant is signed and measures 1 1/4" long by 1" wide. Note: The silver twist wire collar is sold separately. Combine both pieces for best price.